Tony Grainger's design lines were already some of the smoother ones in the business. With the light cruiser industry migrating lately to the wave pierce trends, his concepts updated no problem to the new standards. Tony is now addressing more agressive lines from his initial Barefoot & Raku models, and came up with the 'Flying Fish' Series. These are truly Performance Cruiser range cats, the former G4, now Dna F4 is a 'thoroughbred racer with accomodations' (as we remarked since day 1!) that can cruise with the right people onboard. 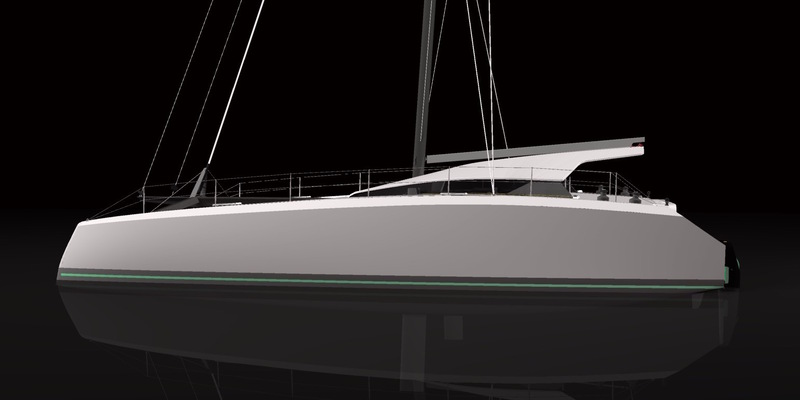 These cats developed from an exercise in using simple streamlined forms to minimise windage, retain the rig aft with a high aspect main and keep the weight concentrated near the mast to reduce pitching and allow fine low profile bows for good wave penetration. Particular attention was paid to the cabin profile to allow clean air flow and to avoid the creation of a large air dam in front of the cabin. 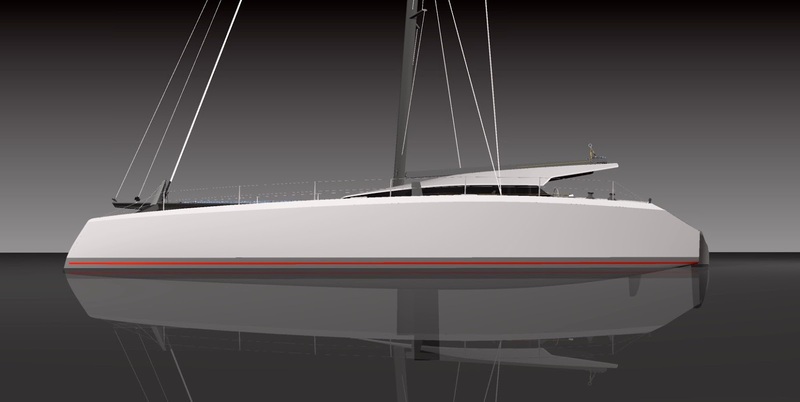 The rig is placed well aft (the mast is at 53% LOA from the bow) and an efficient high aspect sail plan with the foot of the main sealed against the cabin top. 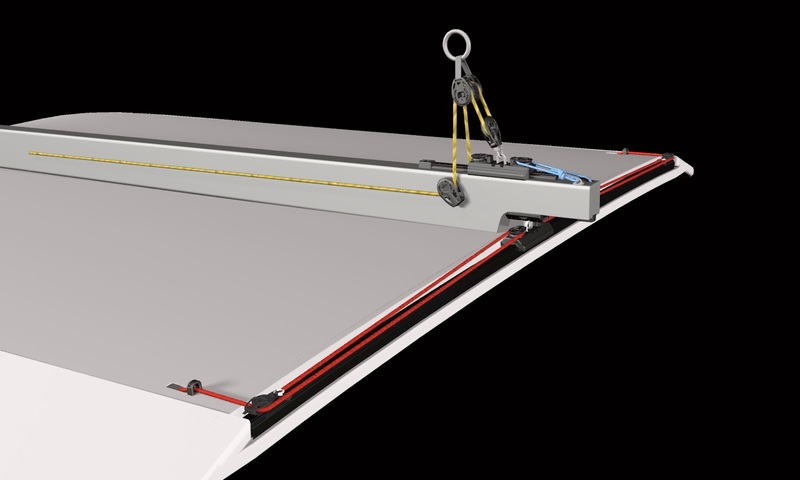 The cabin roof has a strong beams each side and across the trailing edge to provide full control over leech tension. Headsail halyards and reefing lines can either stay on the mast or come aft to the cockpit. 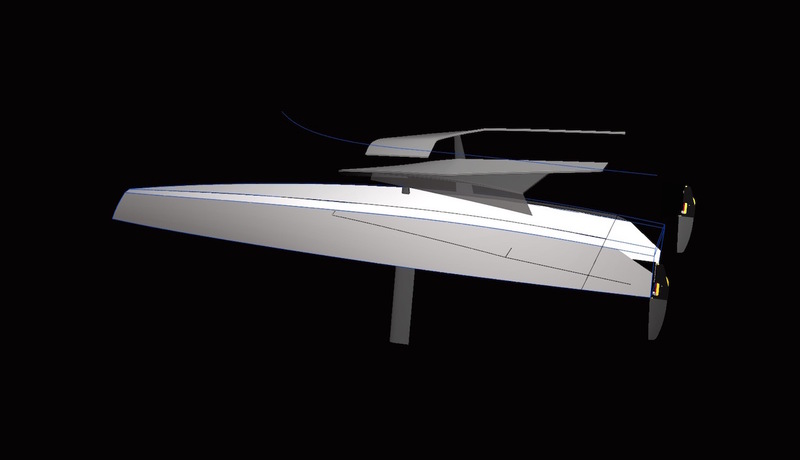 Two rig options will be offered; a non rotating alloy spar with lowers, or a carbon rotating wing section. The original concept toyed with the idea of a boomless main simply supported at the foot with a batten but this introduced complexities for reefing and sail stowage. Out with complexity; the boom makes these things relatively simple; either park avenue style or with open stowage racks on the side. The traveler is rebated in a channel at the trailing edge of the cabin top for clean airflow over the cabin. The traveler control lines lead in a fairly direct route down to the winch beside the helm station. The mainsheet leads forward to the mast on both sides of the boom (it can be internal) and back to the other cockpit winches to port and starboard, and within easy reach of the helm position. The outhaul system is fairly conventional leading forward to the mast inside the boom. A short fore and aft track and car assembly under the boom at the outboard end allows the boom to pivot freely without needing a curved main traveler track. When we start a new series of catamaran designs we usually have a pretty good idea of how much accommodation is expected, where the cabins are located, how much headroom is required and how big the berths need to be. With Flying Fish all that went out the window. The motivation for the Flying Fish series developed from some quick concept sketches thrown down in September 2015, that were gradually developed into 3D models with scant concern for living space. The standard helm design provides for twin wheels on the cabin bulkhead with the high transoms and placement of the coamings providing direct routing of the steering cables to the helm station. The cockpit coaming also provide the opportunity to be used as a helm seat if tillers were fitted directly to the rudders. The first models we built provided for transom hung rudders however the high transom on the Flying Fish models allow us to fit a kick up cassette system set into the back of the hull. This provides an end plate effect for the top of the rudder blade and also provides lateral support for the side loading on the rudder blades, something that presents an engineering challenge when the rudders are hung from pintles on the transom. The current renders show the rudders to be transom hung but this will be changed in future versions. Outboard power is an option for the Flying Fish 45, and possibly for the 50. However inboard diesels are preferred for the 50 and essential for the 60 considering the windage you have to contend with on a vessel this size. I've never been a fan of outboard motors for yachts larger than about 35' LOA but they do have their advantages and I see them being used more often on more performance oriented cruising cats. Inboard diesels provide better reliability, they are more fuel efficient, they provide better battery charging and water heating options. They also help keep the weight close to the centre of gravity and the external appearance at the transoms is a lot more tidy. With the propellor well under the hull they also provide much better security for marginal situations like a bar crossing in disturbed water and light or no wind conditions. I can attest from personal experience this can be a very unpleasant situation to find yourself in with an outboard motor on the transom. Outboards on the other hand are cheaper, lighter (if you accept shorter range for a given fuel load) and you can take them ashore for servicing if you need to, or simply replace them more easily. And importantly for high performance boats you can totally eliminate propellor drag. 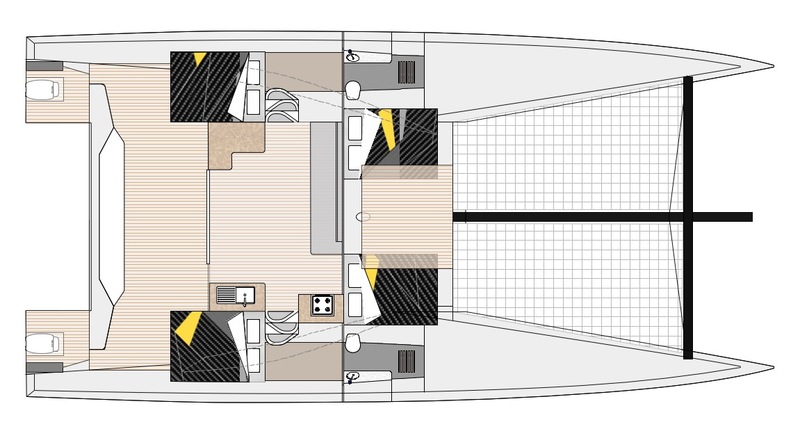 All three flying fish models can carry a modest diesel engine under the double berth in the hull, a similar arrangement to our larger cruising cats. 30HP to about 45 HP would suit the 45 and 50 models. 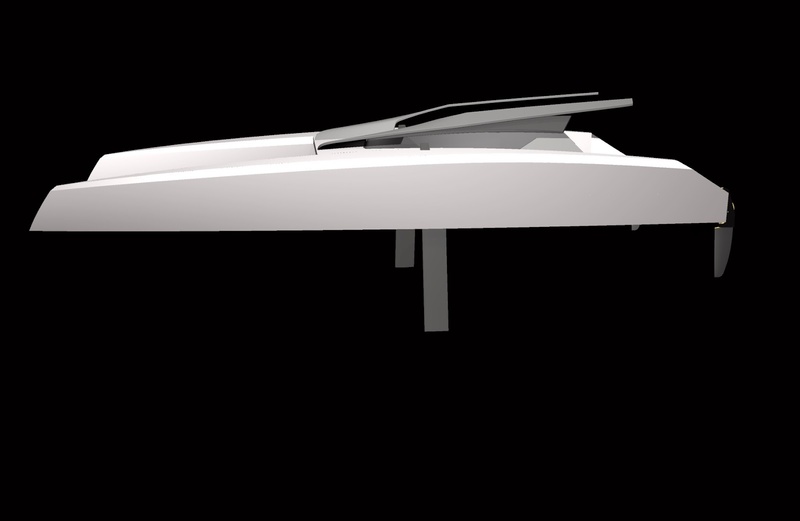 The sixty could carry up to about 75HP either with a sail drive leg or shafts and folding props. The transom is squared off like a beach cat so if the outboard option is preferred there is plenty of height to support the engine in a case that can be set into the transom similar to the rudder case. Lifting on rails or pivot? The mechanism to pivot the outboard is simple in operation- but your outboard will be poking out the back of the boat up in the air when you're not motoring - which will be pretty much all of the time. A cassette set into the transom with a vertical lifting arrangement on slide tracks is probably a more elegant solution. Most of the boat is designed to be built from the waterline up in epoxy/glass panels with PVC foam core. The hull bottoms are round bilge and can be strip planked in foam or Durakore with foam core and Hoop Pine skins. Alternatively any conventional foam/glass construction method can be employed. Carbon specified in high load areas including beams, chainplates, rudders and daggerboards. We welcome enquiries to purchase plans or we can guide you to a building who can quote to build to order. Contact Grainger Designs for more information.